Great Lakes diversions: Does Illinois catch a break? Wisconsin water users are putting their final two cents on water permitting rules at a public hearing today. Lawmakers approved stricter water regulations in New York last week, and are begging for less restrictive limits in Ohio. And Illinois? Well, in some ways it seems like that state is off the Great Lakes hook. It has an exemption from parts of the Great Lakes Compact, an agreement between Great Lakes states to put limits on large-scale withdrawals and diversions of regional waters. Here’s why: Illinois answers to a higher power – a series of Supreme Court decisions allowing the state to divert large quantities of Lake Michigan water. But the state still faces some hefty water restrictions. In the early 1880s, Chicago ran into a sanitary snafu when its drinking water source became its sewage repository. The city reversed the flow of Chicago River and sent its sewage, along with some of Lake Michigan, south through a canal connected to the Mississippi River. Surrounding states were not pleased – especially Missouri, which was getting the full brunt of Chicago’s foul assault. In the early 1920s, Wisconsin – later joined by Michigan and New York – sued, claiming that Chicago’s diversion lowered Lake Michigan by 6 inches. In 1967, the U.S Supreme Court ruled that the diversion was necessary, but capped it at 3,200 cubic feet per second per day– its current level. Fast forward to 2008, when Great Lakes state governors agreed to prevent large-scale Great Lakes diversions and employ conservation measures. Former Illinois Gov. Rod Blagojevich signed legislation consenting to the compact with a couple of big catches: Illinois would not be subject to any part dealing with new or increased water withdrawals. That’s arguably one of the most important compact provisions. But Illinois can divert up to 3,200 cubic feet per second – or 2.1 billion gallons per day – of Lake Michigan water because of the 1967 Supreme Court decision. Unlike other states, Illinois can’t request additional water diversions under the compact, said Dan Injerd, chief of Lake Michigan management at the Illinois Department of Natural Resources. “We can’t get two bites at the apple, just the one we’ve had all along,” he said. Like the other states Illinois has to develop and implement water conservation and efficiency programs and establish a water use baseline. The state’s Lake Michigan Water Allocation program, governed by a special state authority and specific rules, plays a large part in that effort. Illinois is not required to establish a water use permitting system under the compact – which other states currently are doing – but it already has one in place. The state established the program after the 1967 Supreme Court decree. It permits water users who have gone through a long process involving public participation and monitoring of water consumption. That’s not unlike what the other states are setting up under the compact. It may seem like it has more freedom to use Great Lakes waters than other states because of its exemption; they’re actually more restricted. Bordering states are parties to the Supreme Court case and can request to reopen the case if Illinois isn’t keeping its end of the deal, Injerd said. “What we do, how much water we divert, is always subject to review and analysis,” he said. And most other Great Lakes states, with the exception of Minnesota and Pennsylvania, use much more lake water than Illinois, according to 2006 figures from the Great Lakes Regional Water Use Database repository. By law, Illinois is capped at 2.1 billion gallons per day. 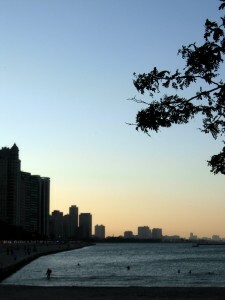 In 2006, it tapped 1.98 billion gallons of Lake Michigan per day. Other Great Lakes states and provinces don’t have limits, and they used a combined 234.9 billon gallons of Great Lakes surface water per day, according to the database. In theory, Illinois could use more Great Lakes water if it were subject to the compact instead of the court decision, but since it has the least amount of watershed in the region, some of its straddling communities would have to apply for Lake Michigan water diversion exemptions. Others would have to find water elsewhere. “Clearly we have substantial water use that occurs out of the original drainage basin in Illinois,” Injerd said. The way it is now, all Lake Michigan water users must apply for permits, but it’s nothing like the lengthy exemption process – just ask Waukesha, Wis. In other Great Lakes states, there are no annual limits and new permitting procedures require only high-quantity users to seek state approval. All Great Lakes states, including Illinois, are limited in regards to diversions. The compact curbs water diversions out of the watershed; bordering communities can apply for exceptions. Illinois state law prevents diversions out of the state. The Great Lakes Compact certainly lets Illinois – or should I say Chicago – off the hook when it comes to water diversions. But since other states own more of the Great Lakes watershed and can access more water, they may have a sweeter deal. I don’t think the other states should or will be complaining too much. After all, this impressive feat (and it is impressive technology) of reversing the river was done to keep sewage out of the lake. A contaminated Lake Michigan isn’t good for the states surrounding Lake Michigan, and it’s not good for the other four great lakes which are connected to Lake Michigan. Are cities like Milwaukee, Detroit, Green Bay, Cleveland, Buffalo, Erie, and scores of others diverting their sewage away from the Great Lakes, or into it? If anything, Chicago or Illinois did its part to help keep the Great Lakes much cleaner. Rachael, good reporting and analysis. Love the watershed map — very cool.